Lack of sun is one of the most common challenges you can face growing in a city. Surrounding buildings, walls, pylons and trees, can all conspire to cast shade on your growing space for much (or even all) of the day. The amount of sun you get is critical – it determines what crops you can grow successfully and productively. As long as your space gets at least three to four hours sun, you’ll have a good choice. Less and it gets more challenging –but do give it a try – some ideas below. If you’re not sure how much sun your space gets, you’ll need to observe if first to find out. 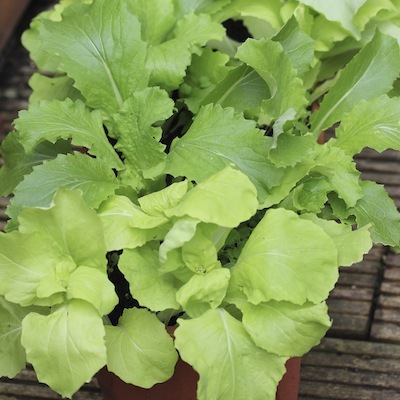 most Asian leaves, including Chinese cabbage, the mustards, pak choi and mizuna. 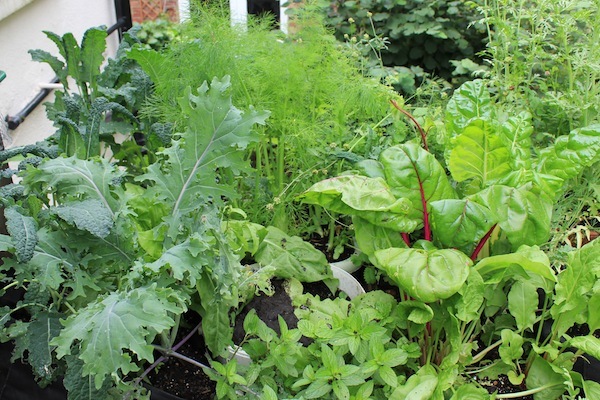 most salad leaves including lettuce, rocket, winter purslane, land cress, and lambs lettuce. Most leafy crops grow well in less sun – this chard and cavelo nero were getting about four hours a day. The fennel at the back did less well – but still OK. While the following herbs, traditionally grown in full sun, will grow OK in less. They will still taste good, if not quite as full flavoured as full sun. 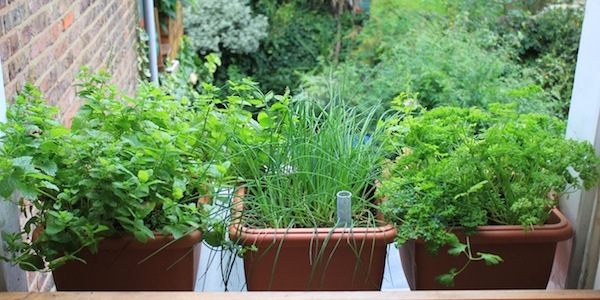 Chives, mint and parsley – growing quite happily on a north facing kitchen windowsill, further shaded by the side wall. Perfectly placed for easy harvesting while cooking! Most fruits require plenty of sun to develop and ripen. The exceptions tend to be the woodland fruits that have evolved to ripen in dappled shade. Professional growers will grow many of these fruits in full sun for a sweeter fruit, but they will ripen fine in less sun – and, depending on your palette, the slightly less sweet fruit can be a bonus. All the following can be grown in containers. The best suited are probably blueberries and alpine strawberries – so these make a good choice to start. 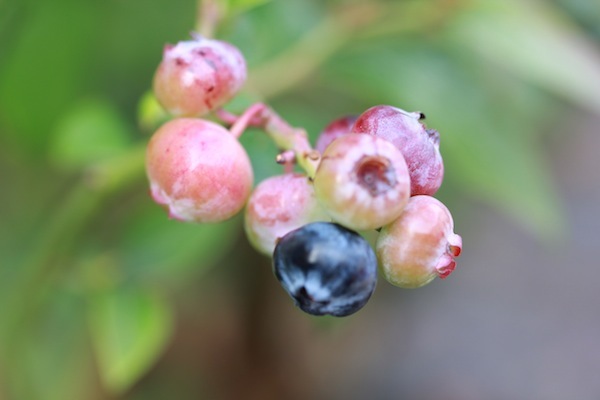 Blueberries do well and taste good when grown in less sun – if not quite as sweet. Less than three hours sun? It’s more difficult to grow food productively in a space with very little or no sun. Crops can grow weak and spindly – and will often be more susceptible to pests and disease. In less sun, the brighter your space is, the easier it will be to grow. See if you can reflect more light into it – for example by painting walls white or adding a white or mirrored backdrop.It’s always fun to experiment though. From my experience of growing in little or no sun, here are some crops I’d recommend to try first. 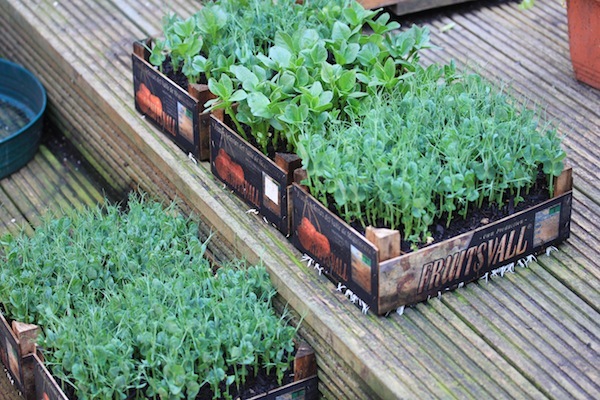 Pea shoots and fava bean shoots grow fine. I think many other shoots like sunflower and chickpea would, too (do let me know if you try). I grew these pea and fava bean shoots in a backyard that received no direct sun. However the walls were painted white so it was quite bright. Chinese cabbage has done well for me – and I think other Asian leaves (eg mizuna, or mustard red giant) would be worth a go. These Chinese cabbages are growing without any direct sun – they are not as strong as they might be, but not bad considering! also perhaps mint on the basis it seems to grow almost anywhere. This wasabi is the only thing I’ve grown that actually seemed to dislike sun, wilting almost immediately. So I kept it on the floor of my balcony in the shade. If you have less than three hours sun and you want more ideas, I’d recommend exploring the Plants for the Future database. 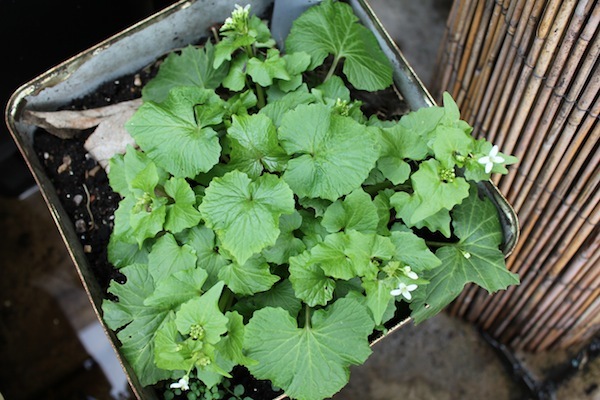 Here you’ll find a number of less conventional edible plants you can grow in a more shady place. Hostas, for example, are edible – some varieties are even supposed to taste good, too!